Want the look of a wood floor or patio with the durability and low maintenance of concrete? It’s not as impossible as it sounds. 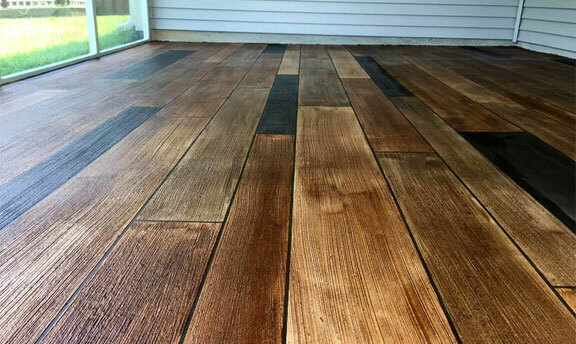 Wood stamped concrete in Nampa, Idaho is a cost-effective way to get the beauty and texture of wood grain on your patio, pool deck, and floors. Our concrete floors that look like wood are just as durable and long-lasting as concrete and combine stamped concrete with stains to get the look you want. Nampa, Idaho wood concrete flooring and patios don’t just look as good as the real thing; they can look even better. This is because the concrete will never splinter or rot. While the color can fade after years of neglect or improper sealing, it can be restored by cleaning and resealing the concrete. If you love the look of a wood deck or wood flooring but don’t want to deal with daily upkeep, wood rot, splinters, and termites, our stamped concrete that looks like wood is the perfect solution. 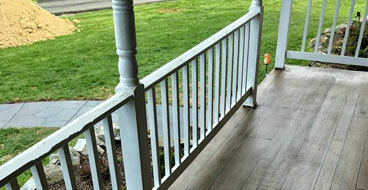 What Is Wood Stamped Concrete? While a wood patio can last for up to 15 years with regular maintenance, stamped concrete can last much longer with almost no care. Wood stamped concrete lasts just as long as regular slab concrete. You can expect a wood stamped concrete floor, patio, walkway, or driveway to last 25 years or even longer. Pavers and wood patios, decks, and floors can all be costly, both in terms of materials and labor. 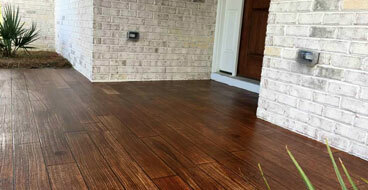 Stamped concrete that looks like wood is an economical alternative to wood whether it’s used indoors or outside. Achieving the stamped concrete wood look in Nampa, Idaho is a fraction of the cost of using real wood and comes with longevity and reduced maintenance to save even more money over time. 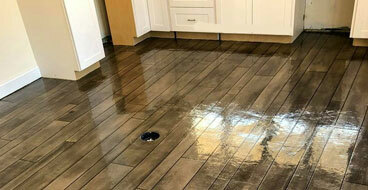 Its durability and reduced maintenance are where wood stamped concrete really shines compared to hardwood. Stamped concrete looks like wood but with reduced care and maintenance over the long run. Hardwood flooring can last 100 years or longer but moisture is always its downfall. In the presence of even high humidity, wood can warp, mold, and mildew. It’s also prone to scratches and gouges. Wood concrete flooring is a low-care alternative to wood flooring in the house with the ability to withstand moisture, heavy foot traffic, pets, and more. While a wood deck or patio can last 10 to 15 years, it requires substantial maintenance, including regular cleaning and staining. Concrete that looks like wood delivers the same beautiful appearance but lasts 25 years or longer with virtually no maintenance.